I’m Lola, I found my mommy new pair of flats and ate one of them, along with her eyeglasses and my uncle sunglasses. 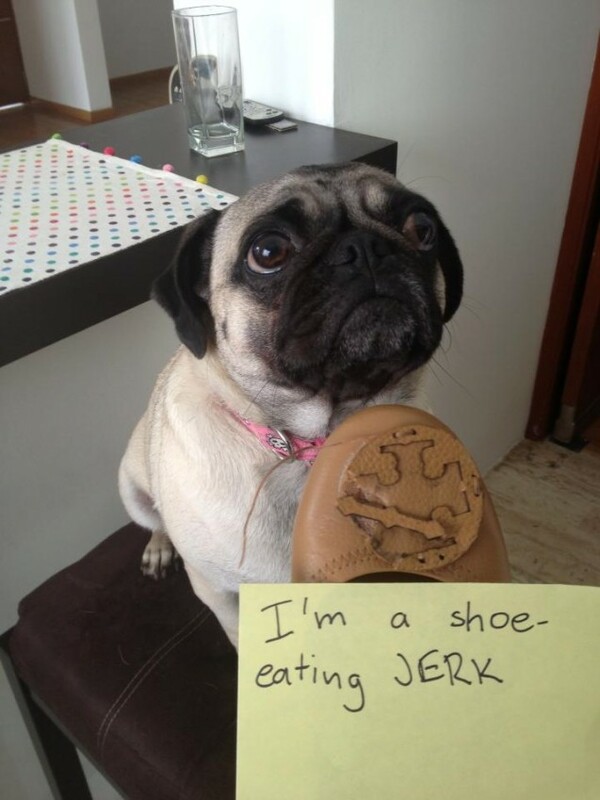 I’m a shoe eating jerk. It took me only 4 pairs of shoes before I learned to put mine away so the pups couldn’t get them. They also ate two pairs of trifocals. I feel mama’s pain..but that face, omg! Didn’t know what Tory Burch, as mentioned a couple of times above, meant so I googled it. Wow, that’s a lot of money for a pair of shoes/dog chewie. Better keep those suckers put up. Your beautiful baby looks genuinely remorseful. Yeah, I’d forgive her. Hope you do, too. Tory Burch will mail you new emblems. I know this because of my boxer and a new pair Tory Burch flats. My hearts dropped when I saw this!